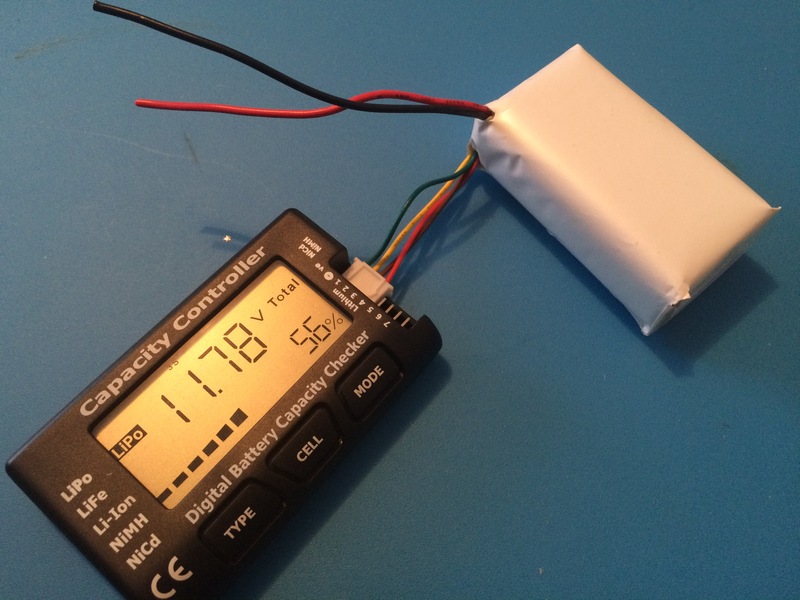 This is a write up of how I made up a very cheap 1000mAh battery pack to run a couple of devices for my quadcopter flying, namely my RC Controller and my FPV headset. 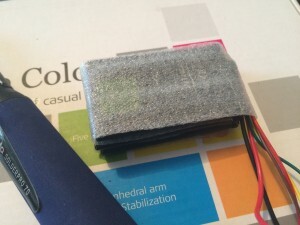 I figured a Lithium ion pack would be cheaper to make and fix if i accidentally ruined a cell with over discharge, so I decided to put my own together out of mobile phone batteries. I searched Ebay for the absolute cheapest standard phone battery i could find and came up with the Nokia BL-4U for just 99p delivered! These look to be legit. Note the Nokia hologram. Danger, Danger, Will Robinson ! Short circuiting can cause it to combust. I may have made that last one up. I don’t want to scare you too much. Li-Ion Mobile phone batteries are “relatively” safe (Li-Po batteries on the other hand are whole other level of potential hazard) The mobile phone cell is usually framed in a strong plastic “skeleton”, it is wrapped in thick metal foil as a fire protection and includes thermal and electrical cut-outs which will kill the power from the battery if anything unusual is detected. The battery terminals are closely spaced and recessed into the plastic. You need a fine tipped soldering iron to get in there. In case of battery fire, always work in a well ventilated place, preferably out side or with easy access to outside. Always have something to hand, such as tongs/pliers, ready to pick up and move a burning battery. If you do have a battery fire, place it in, either a “Li-po Safe” which is a strong fibreglass pouch ( available from ebay) or a metal container/bucket and leave outside to burn itself out. NOTE: This pack cannot delivery enough current to fly a quadcopter. It is only for low current drain devices. Very thin packing foam sheet – I get loads of components delivered wrapped in this stuff. Some sticky backed plastic – I used polyester printer labels. masking tape or sellotape/Scotch tape. Although they are called phone “batteries” they really are just a single Cell, a battery is really a collection of cells. 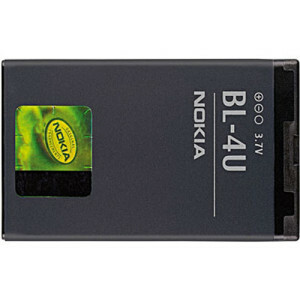 So from now on I’m going to refer more correctly to the individual Nokia batteries as “Cells” and the overall pack as the Battery. Solder your chosen battery connector onto the main power wires first in order to keep the power wires separated and safe. If you forget to do this and end up soldering them afterwards (as i did) remember to keep the wires isolated as you solder them. Strip, solder and heat-shrink each wire separately BEFORE STARTING THE OTHER. If you accidentally touch the wires together, or bridge the connectors with your soldering iron tip, the short circuit will release a lot of current in one go. There is a danger of electrical burns from the sparks and / or starting a battery fire. Twist the battery connector wires together with the appropriate balance connector wires and solder each of them to the appropriate cell, One to the negative of the first cell, the other to the positive of the last cell. Solder the battery interconnects between the 1st, 2nd and 3rd along with the remaining balance wires. That’s as much detail as I’m going to go into. If you can’t follow that diagram you probably shouldn’t be attempting this! I quickly tinned each contact first. You need to be quick with these solder connections. I popped the thermal fuse on one of the cells just trying to solder to it on my first attempt. I fortunately had a spare. Before encasing the pack test its voltages! If you have balance charger or battery tester you should get between 3v & 4.2v per cell. If some cells are reading double what is expected, you have you balanced charge wires crossed. If a cell reads zero you either have the wires crossed, a bad connection or you have popped a thermistor during soldering. 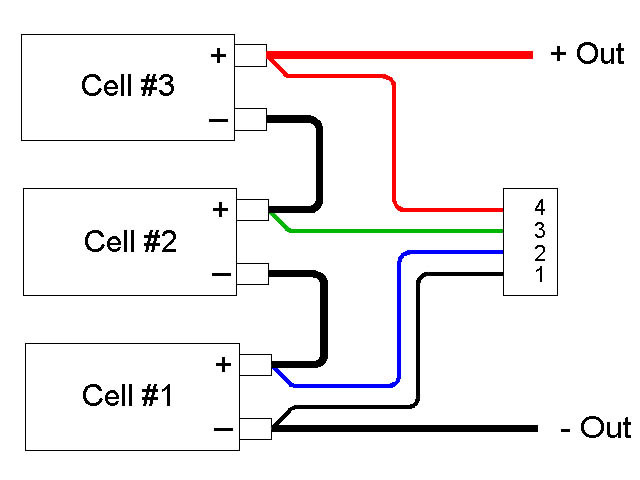 Measure each cell directly with a multimeter to make sure each is providing a voltage. Assuming you have wired everything up correctly you can now start building the pack. Stack the cells with foam sheet in between each one. Finally mark the pack with it’s Battery type “Li-Ion” and nominal voltage “11.1v” and retest with a suitable meter to make sure no connections have snapped. 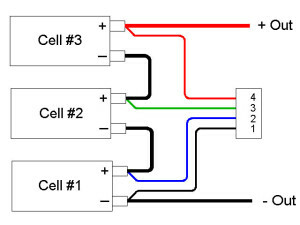 Across the main power wires you should have between 9v – 12.6v depending on the charge state of the cells you started with. If you have less than this or no voltage at all you may have a bust cell. The advised charge rate of a Li-ion Cell is between half (0.5C) and 1 (1C) times the cell rating. These cells are 1000mAh which makes the calculation very easy, between 500mA and 1000mA . ( For a phone battery this falls nicely between the rated output of a USB port and some of the more powerful USB wall chargers). Optimum charge rate for Li-ion is 0.8C. that works out at 800mA for a 1000mAh cell. The cells should remain cool during charge if kept within these parameters. This entry was posted in Flying Things, Member Projects. Bookmark the permalink.